Western Specialty Contractors – Springfield, Illinois Branch (formerly named Western Waterproofing Company) completed a six-month project in October to reconfigure the 7-level parking garage at OSF Saint Francis Medical Center in Peoria, IL. Updates were needed to the post-tension parking garage to improve its parking experience and traffic flow. The general contractor on the project, P.J. Hoerr of Peoria, IL, contracted with Western Specialty Contractors to apply caulking, water repellents and a traffic-bearing membrane to the parking decks. Over the course of the six-month project, Western sealed a total of 191,500 square feet of bare concrete with a penetrating water repellent, applied 100,000 square feet of waterproof urethane traffic coating, and removed nearly 40,000 lineal feet of traffic markings. Hospital officials allowed for a certain number of parking spaces to be closed during each phase of the work, with the garage remaining in full-use throughout the project. P.J. Hoerr worked closely with hospital officials to coordinate a phasing plan that included a total of 14 separate work phases as the project progressed throughout the garage. The general contractor used barricading and temporary signage to direct traffic around the phased closures. 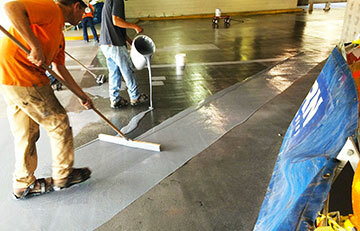 Originally, portions of the parking decks had been coated with a urethane traffic coating, while other portions were left bare. At the exposed concrete surfaces, Western’s workers removed existing traffic markings and striping by utilizing a combination of shot-blasting and hand-grinding. After the existing markings were removed, Western crews sealed the exposed concrete surfaces with a 100% silane, clear penetrating water repellent to reduce the infiltration of hazardous salts, de-icers and other harmful chemicals. At surfaces already coated with a urethane traffic coating, Western crews shot-blasted the existing traffic markings and installed a new top coat to cover the old markings. The staircase and drive lanes between the parking stalls, which exhibited bare concrete areas and a worn coating system due to consistent traffic, were also shot-blasted and re-coated by Western crews to further protect and waterproof the structure. P.J. Hoerr crews completed the project by applying new traffic markings and garage signage, among other finishing work.